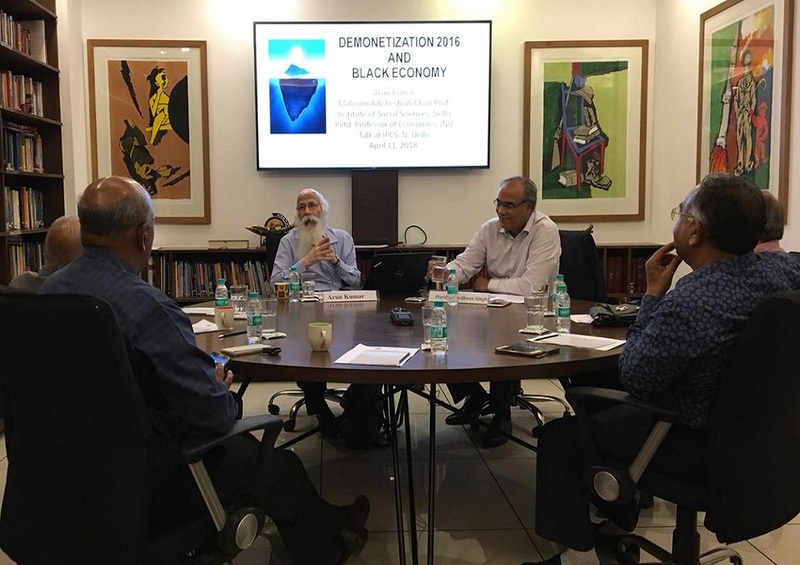 On 11 April 2018, IPCS hosted Professor Arun Kumar for a discussion on his recent book, Demonetization and the Black Economy. The discussion took place from 1500-1630 hrs in the IPCS Conference Room at 18 Link Road, Jungpura Extension, New Delhi. Read the report of the discussion here. "The Narendra Modi government’s sudden demonetisation of INR 500 and INR 1,000 notes in November 2016 failed to put a dent in the black economy but caused untold hardship to hundreds of millions of Indians. It has crippled the country’s economy for a long time to come. In this book, Prof Arun Kumar tells us why Modi’s gambit failed. He shows us the way in which the problem can be rooted out, provided the government has the political will and determination to act. The book, for the first time, lucidly explains the story of demonetisation along with its effects on the economy." Dr Arun Kumar is the Malcolm S Adiseshiah Chair Professor at the Institute of Social Sciences, New Delhi. Prior to this, he taught economics at the Centre for Economic Studies and Planning, Jawaharlal Nehru University (JNU), New Delhi, for three decades. Earlier, he was at the National Institute of Public Finance and Policy, where his work focused on the aspects of the black economy in India. He specialises in development economics, public finance and public policy, and macroeconomics. He has published widely in these areas, both in academic journals and in the media. He has studied, written and lectured extensively on ‘black economy’ for nearly four decades. He has postgraduate degrees in physics from Delhi University and Princeton University, US, and a doctorate in economics from JNU. In addition to his latest book, he has also authored The Black Economy in India, which was published in 1999. Dr Harsha Vardhana Singh is the former Executive Director of Brookings India, where he was also Senior Fellow in the Global Economy and Development Programme. He has worked for over three decades on international trade policy, development, infrastructure regulation and global governance. Dr Singh was Deputy Director-General at the WTO for eight years till September 2013. His direct areas of responsibility included trade in agriculture, services, trade and environment, technical barriers to trade, sanitary and phytosanitary measures, and electronic commerce. In India, he was the economic advisor and then secretary of the Telecom Regulatory Authority of India (TRAI). He has a PhD in Economics from Oxford University.